O j and velocity. For example, these values could be increased tremendously by moving the gas port closer to the chambcr, increasing the piston area, and decreasing the piston mass. Conversely, the piston velocity and energy could be drastically reduced by moving the gas port closer to the muzzle, decreasing the size of the orifice to produce a throttling effect, increasing the mass of the piston, and decreasing the piston diameter. Thus it is evident that, theoretically, the design of a gas-operated gun can be set up readily to achieve almost any desired magnitude of piston energy. It is of interest from the practical standpoint to note that the gas port must be located in the center of one of the rifling grooves. This is important because of the fact that when the rotating band of the projectile is engraved by the rifling lands, fairly-large burrs or flashes of copper are formed at the rear of the rotating band. There is a relief recess behind the band to accommodate these burrs while the projectile passes through the bore. (This recess is sometimes erroneously thought to be provided for crimping the case to the projectile.) If the port were in the land of the rifling, the burr formed by that land would be blown into the gas port by the high-pressure gases behind the projectile as the projectile passes the port. After one or several shots, this could cause the gas orifice to become clogged or could interfere with the operation of the piston. Sincc the port must be located in a groove of the rifling, it is necessary in the design of the gun to be sure that the angular position of the barrel will be correctly related to the gun mechanism. For this reason, it is practically impossible, without redesign, to change the location of a gas port in a gun which has already been built. This same consideration also precludes the possibility of simply rotating the barrel in its threaded mounting in order to adjust the gun for correct headspace. cartridge case separations which otherwise would inevitably result. This is a very serious disadvantage which is inherent in the gas system of operation and its importance can not be overemphasized. 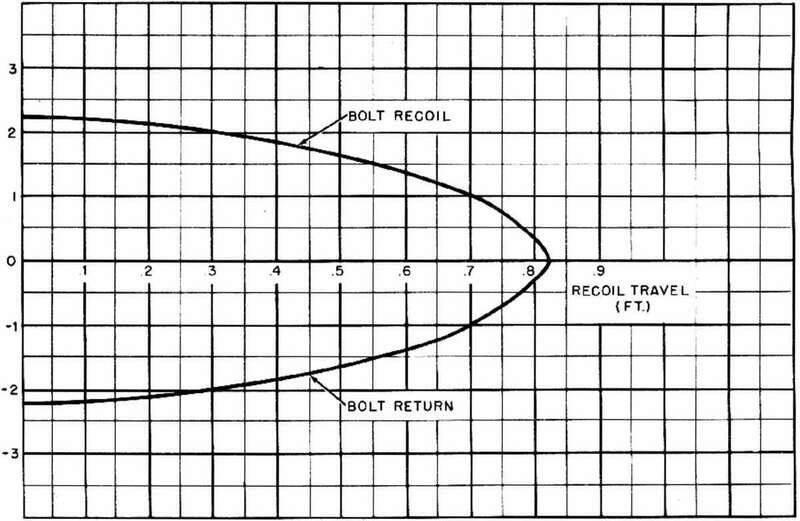 Another real difficulty in most gas-operated guns is that the throttling effect produced by the orifice is extremely critical in determining the operating characteristics. The size and shape of the orifice must therefore be selected with great care and must be controlled precisely in manufacture. In order to reducc the maintenance problem, it is also important to take steps in the design to protect the orifice from enlargement by erosion and from clogging as the result of fouling. To simplify maintenance, many guns are provided with orifice plates which can be removed readily for cleaning or replacement. In some instances, the gun is equipped with a built-in arrangement for substituting orifices of slightly different size so that the gun can be adjusted readily to compensate for changes in performance due to bore wear and other causes. In regard to orifice erosion, it should be noted that the problem of erosion increases tremendously as the gas port is placed closer to the chamber. Although the use of orifice inserts of stellite, molybdenum, or similar materials is of some help in reducing erosion, the severe washing effect of the high-temperature, high-vclocity gas encountered in the initial part of the propellant explosion still places definite limit on how close the gas port can be to the chambcr. The preceding points are primarily concerned with the amount of energy available from gas operation and with the design factors related to the position of the gas port. Another important consideration in gas operation is concerned with how the action of the piston can be timed so that unlocking and the subsequent transfer of energy1 to the bolt will occur in the correct time relation to the variation of the chamber pressure. Before entering into the methods whereby this timing is accomplished, it is appropriate to consider first what conditions of timing will producc the .greatest functional efficiency.